In northern Michigan, Lactarius deceptivus is one of the most prolific late-summer mushrooms. It can reach astounding sizes, and often fruits in great numbers. Initially white, it is soon off-white with light brownish discolorations, and distinctively roughened or even scaly. 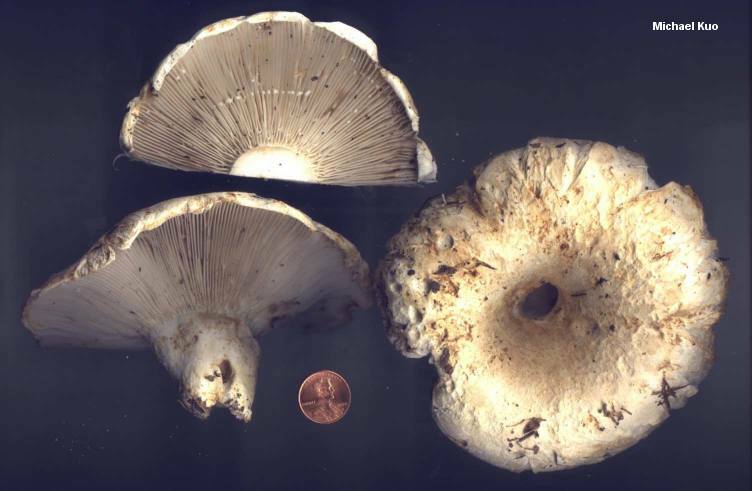 Other distinguishing features include the gills, which are close or almost distant, but not densely crowded like the gills in Lactarius piperatus. The cap margin is inrolled at first, and is very softly leathery, like kid leather. In age the margin is typically still folded under just a little bit, and still soft. 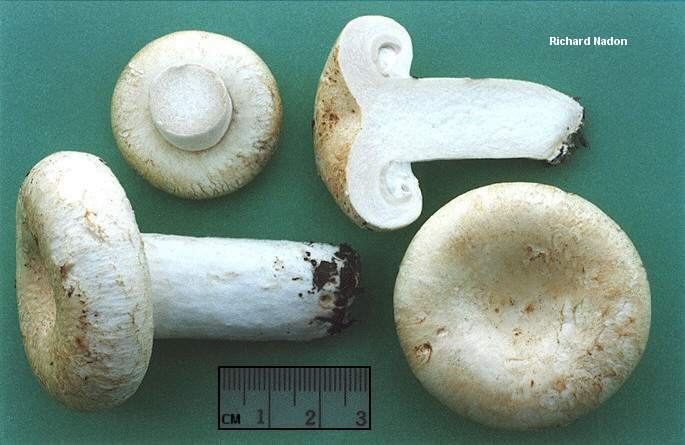 However, the cap and stem are not finely velvety overall, as they are in Lactarius subvellereus var. subdistans. Lactarius deceptivus has a white spore print and a very acrid taste. 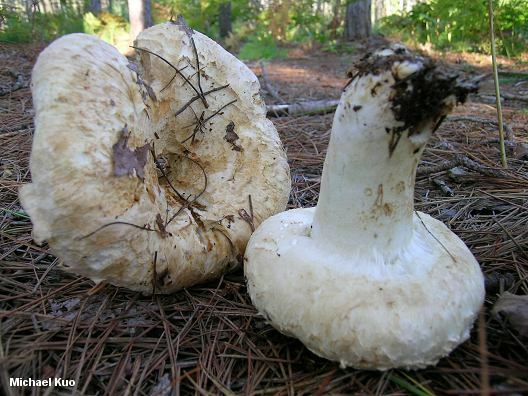 Its milk--the presence of which distinguishes it quickly from superficially similar Russula species like Russula brevipes, which frequently grows alongside it--is white, and stains the gills brownish. Lactarius tomentoso-marginatus, described by Hesler & Smith (1979) as similar to Lactarius deceptivus but with gills that become pinkish and are discolored pale cinnamon by the milk and, under the microscope, spores with lower ornamentation (to about 0.5 µ), has been synonymized by Montoya & Bandala (2005), who found the normal variation within Lactarius deceptivus to account for the putative differences. Ecology: Mycorrhizal with conifers and hardwoods (epsecially oaks); growing scattered or densely gregariously; summer and fall; widely distributed east of the Rocky Mountains; also present in Mexico and Costa Rica; common. Cap: 8-16 (-30!) cm; at first convex with a central depression; becoming flat, with a shallow central depression, or vase-shaped at maturity; at first bald, but soon roughening, becoming torn into patches or scales; dry; the margin soft and cottony, inrolled at first--eventually even or slightly inrolled, but still soft; white at first, soon discoloring tan and brownish. 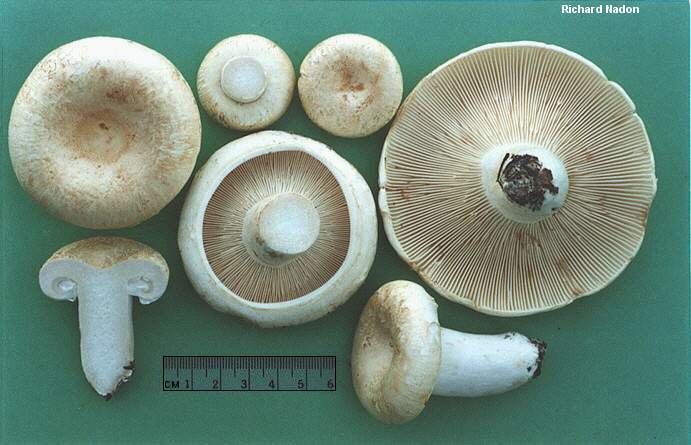 Gills: Attached to the stem or beginning to run down it; close or nearly distant; occasionally forking; whitish or pale yellowish, becoming cream colored and finally dingy tan; usually staining and discoloring brownish. Stem: 3-9 cm long; 1-4 cm thick; whitish, discoloring brownish or tan; hard; dry; smooth or sometimes developing scales; without potholes; more or less equal, or tapering to base. Flesh: Firm in cap; white; unchanging when sliced. Milk: White; unchanging; sometimes staining brownish. Odor and Taste: Odor mild or pungent at maturity; taste strongly acrid. Spore Print: White to buff. Chemical Reactions: Cap surface reddish with KOH. 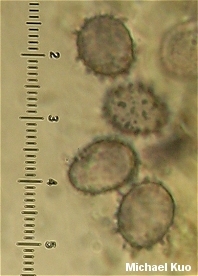 Microscopic Features: Spores 9-13 x 7-9 µ; broadly ellipsoid; ornamentation 0.5-1.5 µ high, as isolated amyloid warts. 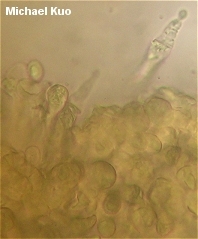 Pleuromacrocystidia subclavate to subventricose or fusiform; abundant; to about 100 µ long. Cheilomacrocystidia similar, but shorter. Pileipellis not clearly differentiated from pileus trama. REFERENCES: Peck, 1885. (Saccardo, 1887; Coker, 1918; Kauffman, 1918; Hesler & Smith, 1979; Smith, Smith & Weber, 1979; Phillips, 1991/2005; Lincoff, 1992; Montoya & Bandala, 1996; Roody, 2003; McNeil, 2006; Miller & Miller, 2006; Kuo, 2007; Binion et al., 2008.) Herb. Kuo 09029508, 09030204.